Initial Impressions does hard to find, heirloom quality work – not just on baby items, but wedding gifts and linens too. This charming Irish linen baby bib caught my eye. It’s so refreshingly elegant. 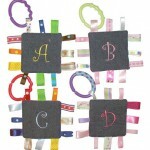 They also have cute, customizable stroller toys, monogrammed bibs and burps. Your little prince or princess will love these mini-arm chairs - more attractive than the average kid seat and just the ticket for your toddler to feel like they are part of the party. The Cutest Things has great burp cloths. You pick the ribbon, font and thread color. Preppiest monogrammed clothes ever found at Buds n’ Branches, including this reversible monogrammed Jon Jon. The ubiquitous Tiffany silver baby cup has always been a tradition in our family and never goes out of style. We actually use our cups - the more dents, the more character they have (and they look divine lined up with orange roses in them). Thirft/antique stores also sell old silver cups, which would be chic monogrammed with a new babe’s initials too. You might have fun making something like this for your little person out of your old buttons or you can buy one on Etsy here. What baby isn’t ready for their own monogrammed Lily Koozie? 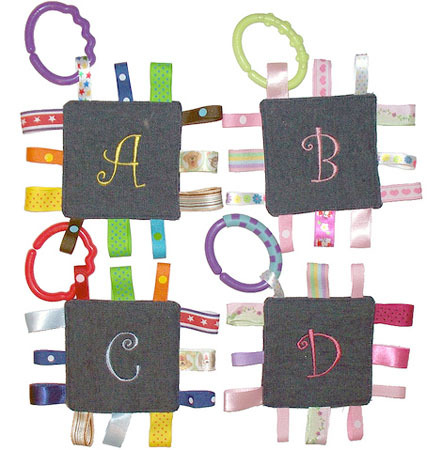 Finally, these letter pillows from Serena and Lily are great for spelling initials or your message of love!